Over the past six decades I have barely changed my conception and principles of design — and quite consciously so — because I believed them to be right back then and I believe them to be right right now. The requirements for our living environment are still essentially human, but as society changes and therefore design changes, so too do the responsibilities of the professional designer. The word “design” is increasingly associated with a growth-oriented consumer society. Instead of being degraded to a lifestyle term, I wish for [it] to stand for something that really helps human beings come to grips with our own world, to get along with each other and also to better our environment. We want to contribute to the preservation of this planet. And in addition there is a very urgent and necessary need to minimize the physical and visual pollution. Good design is as little design as possible. As I said in my principles, “Less design is more.” We want to go back to the pure and to the simple. And simplicity is the key to brilliance. As my credo “Less But Better” implies: Do we really always need new things? In the face of economical and ecological challenges, the design of our environment is now confronted with fundamental changes in meaning. We should consider that we need a design approach that thinks way beyond superficial and cosmetic consumption! And by that I also mean going beyond an exclusively consumer-oriented society. Innovative, useful, aesthetic, understandable, honest, unobtrusive, long-lasting, thorough down to the last detail, environmentally-friendly and finally, as little design as possible – [these] were, and still are, the 10 principles that I first drew up some 30 years ago. But good design does not only come from fulfilling these basic requirements alone. Good everyday design should also always involve a special kind of design that appears to speak for itself. They are rare, but these very special products provide the necessary incentive and the encouragement for the design of the entire living environment. They are the benchmark for the future. During the course of my career I was fortunate enough to be able to work together with innovative, socially responsible and risk-friendly business personalities. But it wasn’t just a case of lucky circumstances, we also shared the same vision for another kind of world. We wanted to produce things that were not aggressively conspicuous, but that were convincing through their use and through their sustainable aesthetic. Tomorrow’s world will be designed by the design students of today — by you — and while this is a great opportunity, this is also a great challenge and a great responsibility. And a great opportunity and chance for you. For over 50 years I have been able to accompany the process both as a product designer and as a university professor. Back then we, too, wanted a different world and a better environment. Designers should always have the ambition to improve the world just a little—after all, it doesn’t improve itself. Today’s main challenges are the protection of the natural environment and overcoming mindless consumption. And there are new, further-reaching challenges coming for the designers of tomorrow. It is no longer enough to think of products alone, designers also need to consider new behavior patterns and how to deal with cultural values and trans-cultural relationships. That requires a design ethos that goes way beyond complacency and arbitrariness. 1. The Functional Dimension, or: Is there an alternative to utility? Concentrating on function, on product utility in the broadest sense of the word, has influenced my work from the very beginning. It is true that we have amassed a great deal of precise design experience over the past years. And that completely new technologies have developed to facilitate the designer’s work. Designers have increasingly learned to use the potential of these new technologies and production techniques, as well as the possibilities that the new materials have to offer. Nonetheless, we rarely achieve perfect solutions. The more we dedicate ourselves to the problem, the more we realize how much still needs to be done. At the same time, as I see it, the area that is described by the term “function” keeps growing and growing. We have learned how complex and manifold the functions of a product can be. Today we are acutely aware that what we create must also have psychological, ecological and social benefits. Most certainly “functionality” is a multifaceted area. But in my eyes, there is no alternative. 2. The Communicative Dimension, or: What should design communicate? Every design process is also about communication: It conveys all kinds of information. On the purpose of a product, on its basic structure, on how to use it, what it can do and what it is worth. Making the information as accurate and easy to understand as possible is also an aspect of the functionality of a product. After all, the better I understand it, the better I can use it. The challenge of designing understandable products has become much more urgent and more difficult. More and more products are being developed with innovative technology and innovative functions. Individual products are required to be able to do more and more, to perform more and more functions, by increasing and growing the area of function in itself. Over the years it has become easier for clever designers to create illusions with design. And these illusions appear to promise even greater success. We must not allow ourselves to exploit the manipulative potential of design. Why? Because I can’t imagine that in the long-term interest of a company, that it would want to deliberately mislead its customers. And certainly that should not apply to society as a whole. 3. The Aesthetic Dimension, or: How much chaos can we live with? My idea of an aesthetically designed environment is, and has always been, one that is so restrained and unobtrusive that one hardly notices it. But it should also be so appealing that one enjoys being part of it, that you’re glad you have the chance to use it and have a sense of being part of it. It should be contemporary in a way that has nothing to do with ephemeral fashions, or any kind of flight from the present into something historical. Imbuing products with these aesthetic qualities has never been easy. And it must always be emphasized that unobtrusive, restrained, matter-of-fact design is not an end in itself. Nor is it a deficiency. To my mind, aesthetic quality in this sense is becoming increasingly important since it has a lasting influence on the mood and atmosphere of one’s surroundings. We are surrounded by a seemingly unlimited supply of products that is not exhilarating in its diversity but chaotic, exhausting and even paralyzing in its excess. That’s why I see it as an important task—maybe as the most important task facing design today—is to help reduce the chaotic clutter that we are forced to live in. 4. The Temporal Dimension, or: How much waste can we afford? There is an unpleasant expression “built-in obsolescence.” It’s introducing new products with the sole intention of devaluing existing ones and persuading consumers to replace them before their time. But that’s really a deliberate waste of money, of materials, of energy and time. Developing products nobody needs is often easier and quicker than developing products that we actually need. Design is often used — or “abused” — as the cheapest way to create an illusion of innovation. Striving to achieve durability through design is one of the key aspects in my view of design. But durability cannot be achieved with design alone. What is needed is an interplay of intelligent product ideas, successful engineering, high quality production as well as well thought-out design. It shows again that design can only really be successful as part of a collective corporate effort. In creating our artificial world, we humans have entered into what has now turned out to be a highly risky endeavor. For in the process we are destroying the natural world on which our survival depends — air, water, soil, plants and animals. Nobody can deny that humankind, industrial production and the sheer diversity of products are threatening to our natural environment. Being “sustainable” in the sense that our natural resources need to be preserved, not destroyed. In this respect, we are facing the greatest challenge that humanity has ever faced. The question is, What can we do? My formula for sustainable production is: Less but better! Much, much less, and much, much better. In dressing up products just to persuade people to buy them, design has contributed, and still contributes, to an everlasting flood of new products. But now design can play an active part in stemming that flood. Many of today’s products are often bought at a high price to the environment, but they are of little use. They don’t last long. They don’t age gracefully. They are so wrong that it is difficult to remain on good terms with them. And of course they all end up in a big rubbish heap, sucking ever new products behind them that are going to be produced. It makes a huge difference if we use our products for one year, five years or for 10. That’s why we need less and less products whose manufacture or use squanders resources or their existence harms the environment. And we need less and less of products that are mere fashion and that are out of date and are thrown away when that fashion changes. What we want instead are products that the consumers should expect. Which is they should make it easier, they should enhance and they should intensify life. Design is primarily an intellectual process. It’s a procedure and an approach to create innovation and new meaning. That’s why we also need a wide range of simple, yet real advances like, for example, intelligent redesign, not just for products but also for buildings before we tear them down. In conclusion, I would like to come back to the importance of companies and entrepreneurs in this process. For me, important constellations always involved an outstanding entrepreneurial relationship and entrepreneurial personalities that I had a chance to work with. At the beginning of the 20th century there was Peter Behrens and Emil Rathenau of AEG, later, in the mid ’50s when I began my career, there was Adriano Olivetti with Nizzoli, Mario Bellini or Ettore Sottsass. I myself was fortunate enough to encounter the Braun brothers in 1955 and Niels Wiese Vitsoe in 1957. “Simplicity is the ultimate sophistication.” That’s the maxim that Steve Jobs used. It’s a quote of Leonardo da Vinci’s. And of course Apple has been, in recent years, the company that most represented and constituted that aspect of design. Both designers and entrepreneurs face an even greater social responsibility for today and for the future. Because it could really be said that we are moving away from competition between products but towards a new form of competition that involves communication, utility and sustainability. Consumers will be more critical in the future of the corporate philosophies and aesthetics that are behind the brands. If we say it differently, we can say that the credibility of a brand will depend on its real, qualitative and useful content and not on its media-projected message. If changes in the social and behavioral values within a company do not occur hand in hand with changing values in society, dangerous value conflicts will ensue between a company and its environment. This is a matter that must be taken seriously today. For utilitarian and ecological qualities will most definitely play a crucial role in positive product experience in our future. Mahatma Gandhi once said: “We must be the change we want to see in the world.” Let us start by changing attitudes. 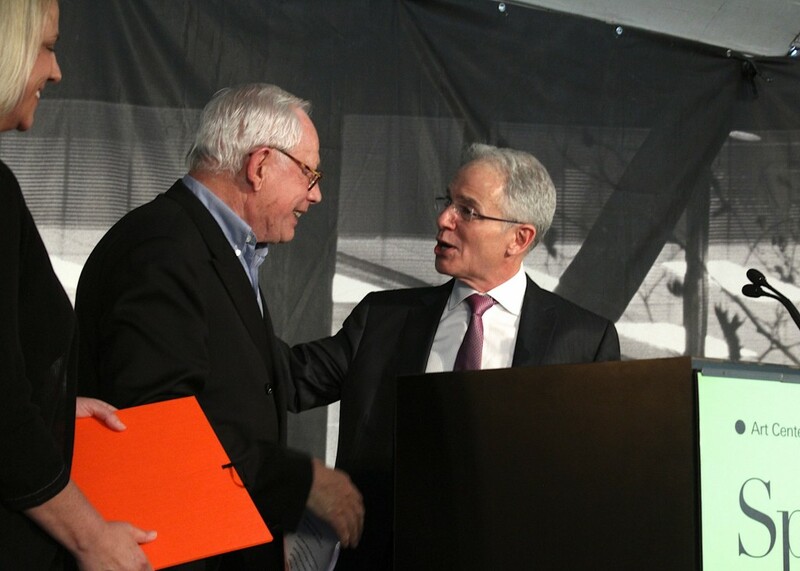 Following is a 3-minute clip from Objectified, a 2009 documentary about Dieter Rams, which was shown at the 2013 Spring Graduation Ceremony.